As its name suggests the Konica Minolta MagiColor 1690MF Printer is a multifunction printer that is small enough to fit on a desk and still deliver quality prints. Compact multifunction printers are now getting mainstream attention as the demand for them by home-offices and small businesses increase. The functions that this compact machine offers range from being a printer, copier, scanner and fax all rolled into one. Designed for home and small office desks, the printers dimensions of 16.0” x 16.9“ x 17” is perfect for most desk tops. The printer is also capable of printing high quality images at 1200 x 600 dpi and can churn out prints at a rate of 20 ppm for black and white prints while colored prints take longer at 5 ppm. With a monthly duty cycle of 35,000 prints, you will be able to print lots of documents or images. Replacing the toner cartridge is simple with the easy to access front panel and a single toner can print up to 2,500 pages until it runs out. The 35 page automatic document feeder makes scanning, copying, and faxing relatively easy, without the need of having to open and refill the paper to be processed. Since this is a multifunction printer, there are more features that this machine offers. Faxing for instance, with speeds of up to 33.6 Kbps and 6 MB of memory, decent specifications for most fax machines. The scanner on this machine is rated at 20 opm for monochrome and 3.3 opm for color and is capable of scanning at a bit depth of 256 colors. Weighing only 46 pounds, this is truly a desktop multifunction printer that small offices can certainly have. The printer is very quiet emitting only noise during operation at 52 dB(A) and standby noise at 32 dB(A). It also connects physically into the network as it is equipped with an Ethernet 10/100BaseTX and USB 2.0 for easy network and local connections. This connection gives the MagiColor 1690MF Printer the capability to print, scan and faxes over a network. The machine, also Energy Star Rated, allows you to save on energy costs. This printer has several other add-ons, including the 500-sheet paper tray which will significantly increase the tray capacity. The stock paper tray only has a 200-sheet paper capacity. 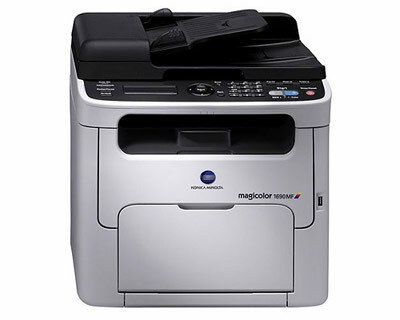 Compared to other multifunction printers, the MagiColor 1690MF is cheaper than other office machines on the market. The most notable disadvantage the Konica Minolta MagiColor 1690MF Printer has is it is difficult to setup on a network. Installing the machine on a network is difficult and has some issues on automatic IP address detection of other devices. Also the features need to be installed separately not just one installation and the machine is ready. Once you overcome the installation hurdles, the printer runs smoothly and works excellently, especially the printer feature. Printing costs are relatively high. A monochrome page costs 3.1 cents and a color print costs 16.7 cents a copy. The stock paper tray which can handle 200 sheets can be troublesome if your business is heavy on printing jobs. An add-on is available, for a cost, to add a 500-sheet tray. 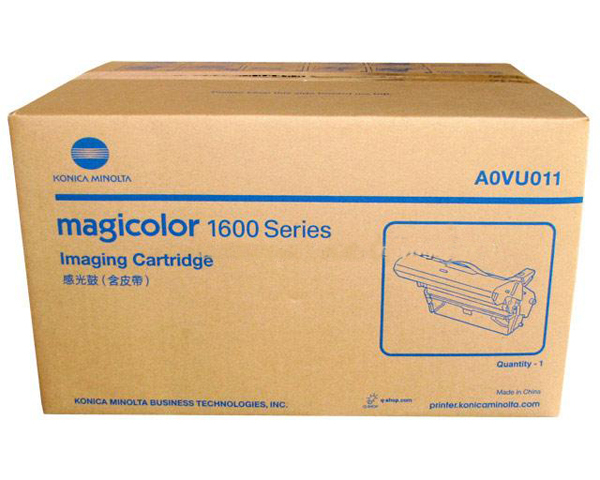 Review it: "Konica Minolta MagiColor 1690mf "
The accessories for the MagiColor 1690MF Printer include the 500 sheet paper feeder or tray. An automatic duplexer is also available allowing you to print on both sides on the page. 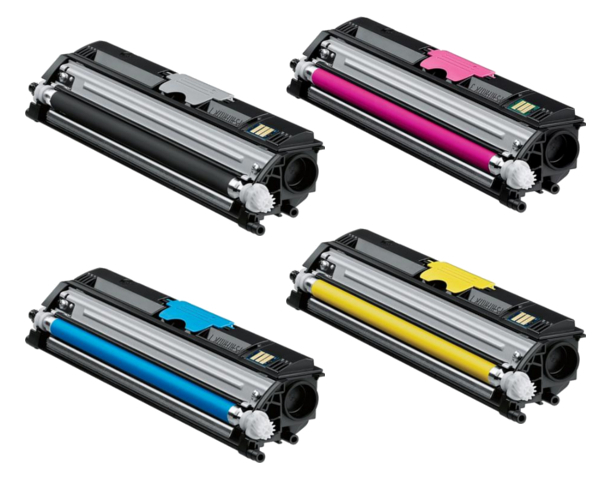 The MagiColor 1690MF utilizes four color toner cartridges: black, cyan, magenta & yellow. Each cartridge yields 2,500 pages.